Please review the following basic terms that govern your use of and purchase of products from our Site. Please note that your use of our Site constitutes your agreement to follow and be bound by those terms (the “Agreement”). General: We may from time to time change the terms that govern your use of our Site. Your use of our Site following any such change constitutes your agreement to follow and be bound by the terms as changed. We may change, move or delete portions of, or may add to, our Site from time to time. Site Content: Unless otherwise noted, all materials, including images, illustrations, designs, icons, photographs, video clips, and written and other materials that appear as part of the compilation of this Site (collectively, the “Contents”) are copyrighted materials protected by federal and international copyright laws. To the extent that we include certain trademarks or service marks owned by other parties on the Site, such trademarks and service marks are the property of their respective owners. The contents of our Site, and the Site as a whole, are intended solely for personal, noncommercial (other than for the purchase of merchandise from our site) use by the users of our Site. You may download or copy the contents and other downloadable materials displayed on the Site for your personal use only and not for any commercial or other use. No right, title or interest in any downloaded materials or software is transferred to you as a result of any such downloading or copying. You may not reproduce (except as noted above), publish, transmit, distribute, display, modify, create derivative works from, sell or participate in any sale of, or exploit in any way, in whole or in part, any of the contents, the Site, or any related software. Communications to You: You agree that we may send electronic mail to you for the purpose of advising you of changes or additions to this Site, about any of our products or services, or for other purpose(s). Product Information: The prices displayed at the Site are quoted in U.S. Dollars. We have made every effort to display as accurately as possible the colors of our products that appear at the Site. However, as the actual colors you see will depend on your monitor, we cannot guarantee that your monitor’s display of any color will be accurate. 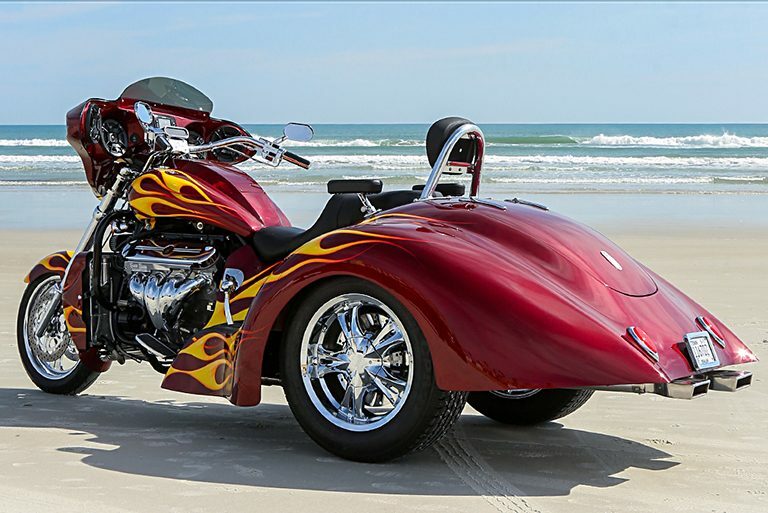 Links to Other Web Sites: To the extent that this Site contains links to outside services and resources, the availability and content of which Boss Hoss Motorcycles does not control, any concerns regarding any such service or resource, or any link thereto, should be directed to the particular outside service or resource. DISCLAIMER: PRODUCTS PURCHASED THROUGH THIS SITE ARE SUBJECT TO BOSS HOSS MOTORCYCLES REFUND POLICY AS EVIDENCED AND PRINTED ON YOUR INVOICE. ANY WARRANTIES ARE PROVIDED, IF AT ALL, BY THE MANUFACTURER OF THE PRODUCTS. BOSS HOSS MOTORCYCLES IS NOT THE MANUFACTURER OF THE PRODUCTS IN OUR ONLINE STORE. OTHERWISE, THIS SITE AND ALL CONTENTS OF THE SITE ARE PROVIDED ON AN “AS IS” BASIS WITHOUT WARRANTIES OF ANY KIND, EITHER EXPRESS OR IMPLIED, INCLUDING WITHOUT LIMITATION WARRANTIES OF TITLE OR IMPLIED WARRANTIES OF MERCHANTABILITY OR FITNESS FOR A PARTICULAR PURPOSE. YOU ACKNOWLEDGE, BY YOUR USE OF THE SITE, THAT YOUR USE OF THE SITE IS AT YOUR SOLE RISK, THAT YOU ASSUME FULL RESPONSIBILITY FOR ALL COSTS ASSOCIATED WITH ALL NECESSARY SERVICING OR REPAIRS OF ANY EQUIPMENT YOU USE IN CONNECTION WITH YOUR USE OF OUR SITE, AND THAT WE SHALL NOT BE LIABLE FOR ANY DAMAGES OF ANY KIND RELATED TO YOUR USE OF THIS SITE. To the extent that we provide information or content from parties or entities not owned by Boss Hoss Motorcycles and third parties, such content is provided only for informational purposes and we do not independently investigate the validity or accuracy of the information provided, and we expressly disclaim all warranties express or implied relating thereto. From time to time there may be information on bosshoss.net that contains typographical errors, inaccuracies, or omissions that may relate to product descriptions, pricing, and availability. We reserve the right to correct any errors, inaccuracies or omissions and to change or update information at any time without prior notice (including after you have submitted your order). We apologize for any inconvenience this may cause you. Indemnification: You agree to defend, indemnify and hold Boss Hoss Motorcycles harmless from and against any and all claims, damages, costs and expenses, including attorneys’ fees, arising from or related to your use of the Site. Miscellaneous: This Agreement shall be construed in accordance with the laws of the State of Tennessee, without regard to any conflict of law provisions. Any dispute arising under this Agreement shall be resolved exclusively by the state and federal courts of the State of Tennessee. This Security and Privacy statement discloses the privacy practices for http://www.bosshoss.net. This statement does not apply to the practices of companies that Boss Hoss Motorcycles does not own or to people that Boss Hoss Motorcycles does not employ. Commitment To Privacy: Boss Hoss Motorcycles values its customers and respects their privacy. In connection with demonstrating its commitment to your privacy, Boss Hoss Motorcycles has agreed to disclose its information and privacy and security practices. If you feel that Boss Hoss Motorcycles is not abiding by its posted privacy and security practices, you should contact our customer service department at 1-731-286-4915. Information We Collect and Use: We collect information about you (such as your name, e-mail address, mailing address, phone number, e-mail/IP address, transactions with us, and credit card number) that you provide when you place an order or that you provide to us in any other way. We may acquire customer names, e-mail addresses or mailing addresses for select mailings from third parties. We use the information that you provide for purposes such as responding to your requests, communicating with you, improving our services, conducting research, providing anonymous reporting for existing and prospective clients or advertisers, and processing and confirming your order. From time to time, we may also use your information to notify you about our products, services, contests, or promotions. Except as otherwise provided herein, we do not sell or rent the information that you provide to us online to third parties. Ordering: We request information from you on our order form. Here, a customer must provide contact information (like name and shipping address) and financial information (credit card number, expiration date, and billing address). This information is used for billing purposes to verify the customer is of legal age, and to fill customers’ orders. If we have trouble processing an order, this contact information is used to get in touch with the user. Sharing of Information: We value your privacy at Boss Hoss Motorcycles, and will not release any personally identifiable account information to anyone outside of the necessary core groups that help our business function unless our customers give us the authority to do so or otherwise in accordance with this privacy and security statement. We will share aggregated demographic information with our partners and advertisers. This information, however, is not linked to any personal information that can identify any individual person. We may from time to time use an outside shipping company to ship orders or a credit card processing company to bill users for goods and services. Additionally, we may contract with third parties to assist us in maintaining or managing our customer information. In such events, we will advise these companies not to retain, share, store or use personally identifiable information for any secondary purposes. We may be required to use your information to respond to court orders or subpoenas or to establish or exercise our legal rights or to defend against legal claims. We may share information in order to investigate, prevent, or take action regarding illegal activities, suspected fraud, or as otherwise required by law. We may transfer your information if Boss Hoss Motorcycles or the assets thereof are acquired by or merged with another company. Links: In the event that this web site contains links to other sites, please be aware that Boss Hoss Motorcycles is not responsible for the privacy practices of such other sites. We encourage our users to be aware when they leave our site and to read the privacy statements of each and every web site that collects personally identifiable information. This privacy statement applies solely to information collected by this web site. Security: When our order form asks users to enter sensitive information (such as credit card number and/or social security number), that information is encrypted and is protected with the encryption software – SSL (Secure Socket Layers), provided by VeriSign, a premier encryption software company. While we use SSL encryption to protect sensitive information online, we also take actions to protect user-information offline. Our users’ information is generally restricted in our offices. Our employees are notified and/or reminded about the importance of keeping our customers’ information secure and safe at all times. The servers on which we store personally identifiable information on are kept in a locked and secure environment. Children: Please note that if you are under 18, you may purchase products from bosshoss.net only with the involvement of a parent or guardian. Correcting/Updating Personal Information: If your personally identifiable information changes (such as your shipping or billing address, your preferred credit card, etc. ), you can add new information or delete any addresses or credit cards from your account on our website or you may obtain live one-on-one help by phone at 1-731-286-4915. Notification of Changes: If we decide to change our privacy and security statement, we will post those changes on our Homepage so our users are always aware of what information we collect, how we use it, and under what circumstances, if any, we may disclose it. We will use information in accordance with the privacy and security statement under which the information was collected. Agreement to Privacy and Security Statement. By using our Web site, you agree to the Boss Hoss Motorcycles privacy and security statement as provided above.